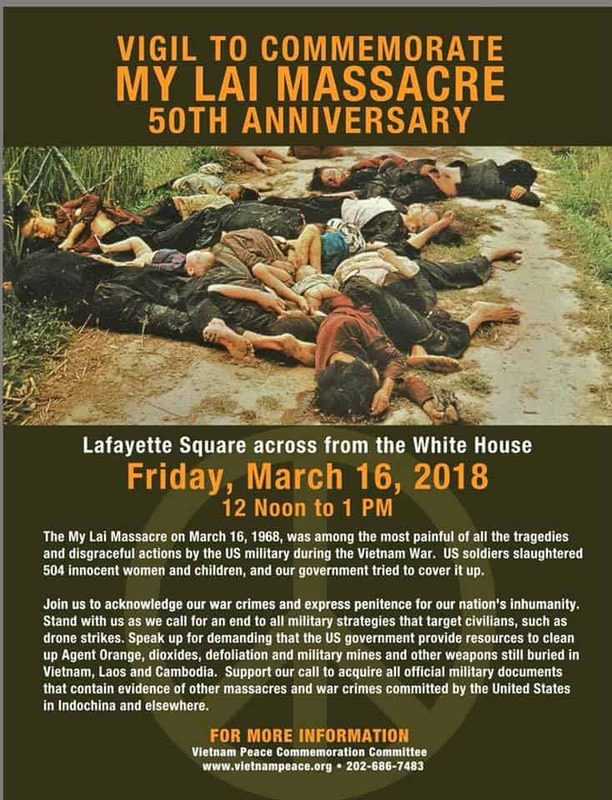 The My Lai Massacre on March 16, 1968, was among the most painful of all the tragedies and disgraceful actions by the US military during the Vietnam War. US soldiers slaughtered 504 innocent women and children, and our government tried to cover it up. Join us to acknowledge our war crimes and express penitence for our nation’s inhumanity. Stand with us as we call for an end to all military strategies that target civilians, such as drone strikes. Speak up for demanding that the US government provide resources to cleanup Agent Orange, dioxides, defoliation and military mines and other weapons still buried in Vietnam, Laos and Cambodia. Support our call to acquire all official military documents that contain evidence of other massacres and war crimes committed by the United States in Indochina and elsewhere.